Terranea Resort, led by their Green Team, ran an extensive employee engagement campaign to separate, measure, and prevent food waste at their property. The challenges and successes the property faced during this 4-month demonstration period can be found below. Terranea Resort has implemented an array of creative solutions and strategies to motivate a food waste prevention culture at the property. Such programs include trayless employee dining, active bin monitoring and staff feedback, pre-shift green team presentations, an employee Clean Plate Challenge, and staff celebrations on Earth Day and World Oceans Day. In July, a renovation of the employee dining room eliminated the use of trays and reduced the standard plate size. Staff is engaged through bin monitoring, bin count guidance, Lobster Ink training videos and food waste task force lessons during lineups. To reduce confusion around bin placement and location, engineering staff used tape on the floor to designate the location and size of each bin. This program is garnering increased support from upper management and food and beverage departments. 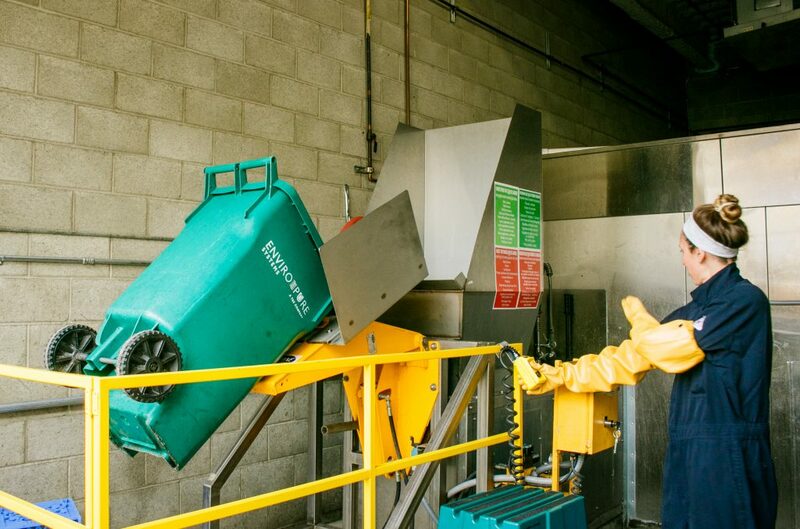 Increased use of their onsite biodigester keeps food waste out of landfills. Terranea Resort embraces the vision of Destination Hotels environmental initiative, Destination Earth, in decreasing energy and water usage, reducing waste, increasing recycling and composting, and purchasing local and organic food and beverages when possible. Sustainability staff led the pilot and, given their peripheral involvement with other key functions such as engineering and culinary, faced challenges fully engaging participants from all necessary departments. This led to unevenly dispersed program roles, resulting in limited staff adoption. Successful training, especially on appropriate bin replacement, could have increased diversion to the biodigester. Online video training proved difficult given restrictions on staff time and a lack of computer access. As a result of pilot participation, Terranea strengthened their relationship with Chefs to End Hunger. Multiple times a week, staff pack and label the requisite Chefs to End Hunger boxes and store them in coolers until the scheduled pick-up. This requires significantly less training and labor hours than loading the biodigester and recovers food for the local community. In the coming months, Terranea plans to strengthen the systems currently in place including food waste prevention training, roll out of Lobster Ink videos, biodigester diversion and observation, Chefs to End Hunger donations, and the use of AVERO SLINGSHOT, their new business intelligence system. Terranea also plans to expand this program to other property restaurants.